Product #45976 | SKU SLR-3514MFT (II) | 0.0 (no ratings yet) Thanks for your rating! The SLR Magic Cine 35mm T1.4 Mark II Lens with Micro Four Thirds Mount supports cine-style shooting on a camera with a Micro Four Thirds Mount. It features a fast T1.4 to T16 aperture range with a clickless iris that allows smooth pulls, and geared focus and aperture rings. The lens follows the industry standard focus rotation, so when working with an optional follow focus unit there is no need to make an adjustment to how you work or add a reversing gear. 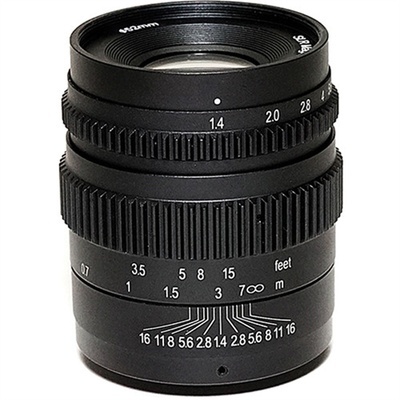 The lens front does not rotate as you focus the lens; this allows you to use optional accessories such as clip-on matte boxes, or the SLR Magic Anamotphot adapter. The mark II features stronger mechanical components than the mark I version of the lens, allowing you to use the optional SLR Magic Anamporphot adapter or achromatic dioptres without requiring an optional lens support. The clickless iris allows you to smoothly adjust your exposure during the shot. Built-in iris and focus gears follow industry standards, allowing you to work with optional follow focus units and lens gear motors. Focus rotation of the lens follows the cinema standard, allowing you to swap between this and other optional lenses without having to change your workflow.